In a YouTube video, Barack Obama’s uncle, Sayid Obama, says plainly, and in English, that Barack Obama’s first time in Kenya was in 1987. The following transcript starts at 3:30 in the video. Sayid Obama: It was his first time in Kenya. I can say it was kind of happiness mixed with some sadness because he was a person coming to see this site of his family and at the same time coming to see where his father was buried. This video puts to the lie the claims that Obama relatives are banned from giving interviews. I have to ask myself, why would put important “evidence” on You Tube? Notarized, signed affidavit too? Duh! Misread the article–clearly says NOT BORN IN KENYA. Apologies. I was quite proud of myself finding that after poring over YouTube videos. There area a number of videos of Sarah Obama and they all talk about Barack Obama visiting Kenya 3 times. In the other videos, it is the narrator that says this, making it clear Obama was not born in Kenya, and if he had, those videos with their context would have to mention something like a Kenyan birth–but they do not. However, in this video, an Obama relative states unequivocally that Obama’s first time in Kenya was in 1978. This video confirms the visit to Kenya sequence at other times. It also puts into context the phrase “son of the village” so that we know that it doesn’t mean literally born in the village. This puts to lie what people say that “everybody in Kenya knows Obama was born there”. Heh, the articles on this site do usually read the other way, but this one was too important to fool around with. Exactly, I was so used to articles stating “Obama Born In Kenya”, that I didn’t bother to read what was posted. LOL That is a sign of something, right? The narrator says the first time to visit his father’s grave – not the first time. The first time to visit his father’s grave. The uncle certainly seems to say it is O’s first time to visit Kenya (for any reason), but this does still not preclude his being born here. In other words, this is the first time O has come to “visit”. In other words, it is his return as an adult. Do I think this is what happened? No. But this language is still ambiguous. But Sayid did not say “first time to visit Kenya” he said “first time in Kenya”. I do not see how this is ambiguous. Regardless of where he was born, he does not meet natural born requirements, he had dual nationality…which he admits. 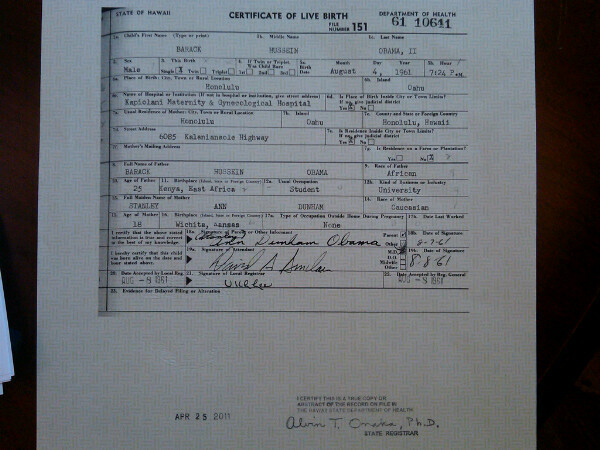 to be natural born you need TWO US citizen parents, Obama only has one. 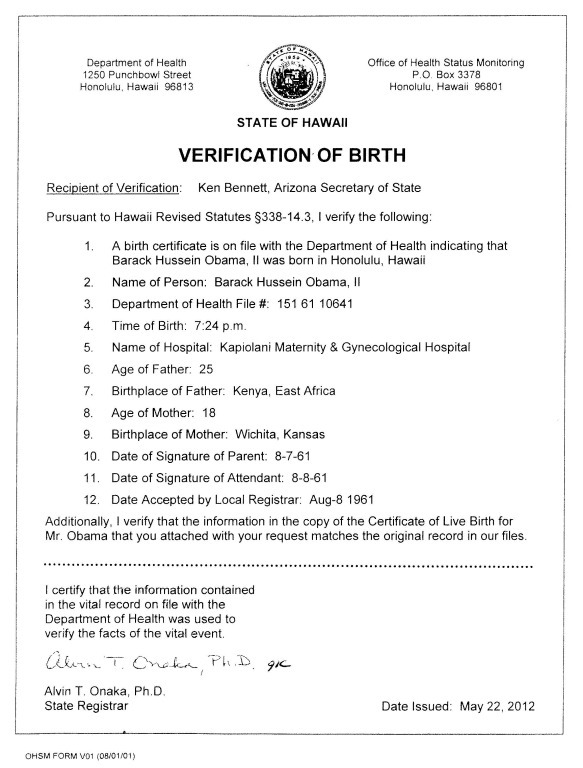 SO even if he were born in Hawaii, he is still not natural born, he is just a citizen. He is not eligible. Instead of “repeating” what you have been told or heard, I suggest you go to the section labeled “bookmarks” on this blog and read. It news footage essentially, not intended as evidence. HAHAHAH I just love the way Bob tried to re-word it to fit his beliefs. Wow how did you get, “In other words, it is his return as an adult.” from the word “visit” (the word you added)? elg’s vs perkins. Ruling on “natural born” (must have TWO US citizen parents) even if they are naturalized parents, they must be US citizens. There is a predendent. Obama is a citizen, but he is not a natural born citizen and there is a difference. I have researched this from every angle, pro sites and con sites, and it seems to me that its easy to post only articles that YOU have read elsewhere and present them as facts…but only if they agree with your own stance. Cases on the books are more accurate. Elg’s vs Perkins…..look it up. Anne, I am puzzled by your remark. I course I have read Elg v. Perkins and quite a bit more. For a more detailed presentation of my views, see my article on Natural Born Citizen. The decision declared Elg to be a “natural born citizen”. The facts were that her parents were naturalized American citizens and Elg was born in the United States. But nothing in this case remotely says two citizen parents is a requirement for natural born citizenship. The part about her parents being naturalized is listed in the facts of the case at the beginning and the aside about her being a “natural born citizen” is in a far-away paragraph. Nothing links a particular fact of her birth to being “natural born”. One citizen, two citizens, born in the US each or in combination could have been how she got to be “natural born”. The decision stated that Elg did not lose her citizenship when her parents moved back to Sweden and took up Swedish citizenship.The only bearing this case has on the current controversy is to put to rest all this stuff about Obama losing his citizenship by his sojourn in Indonesia. See also Rogers v. Bellei where the court made a distinction between the quality of citizenship by law (here citizenship through parents) and a Constitutional citizen (one born in the United States). United States v. Wonk Kim Ark is a much more relevant case and a decision that surveys the whole history of citizenship law and previous cases. See also Mandoli v. Acheson for some commentary on the Elg case in another decision. If you are interested in reading the great mother of case law on natural born citizen, I suggest this article from What’s Your Evidence. Don’t worry about Bob. He’s going to be focusing on lizard people in the future. As always, you posts are right on point. Bogus has hi jacked this site. Call BHO and get her in the cabinat. there is opinion, then there is what SCOTUS has actually ruled on. To my knowledge it has only been ruled that TWO citizen parents, even if they are naturalized citizens are required for any child to have “natural born” status. If not, from my understanding, they are only citizens…and do not meet the natural born clause of the constitution. I think its clear what our founders meant when they excluded themselves from having to be natural born(at the conception of the constitution), as the country was new…but that all presidents to come have ONLY alligence to the US. Obamas fight the smears site admits he had dual nationality…as his father was not and never intended to be a US citizen. At one point in time, laws stated that if a woman married a foreigner she gave up her US citizenship….of course that law has now changed….but my point is you are refering to a lot of “opinion” not actual cases that have been heard by SCOTUS. No one oversees who is eligible, you do not have to prove you are actually eligible to be on the ballot…case in point, Roger Calero…on the ballot this past election cycle and not a US citizen. He should just show his long form b.c. or this will hang over his head and case after case will be brought…. its inevitable that at some point, someone will prove “standing”, and then he will have to show proof. It just would seem easier for him to just pay the 12 bucks to get a long form birth certificate. But then again thats only my opinion. A quick search in Westlaw (paid subscription required – “Vattel”) indicates that the U.S. Supreme Court has quoted and/or referenced de Vattel approximately 150 times. There is no Supreme Court ruling requiring any citizen parentage for either citizenship or natural born citizenship. If you think there is such a ruling, WHAT IS IT? It is true that Vattel is cited in many cases, but NOT on citizenship cases (except on the losing side of US v. Wonk Kim Ark and in that stain on the Supreme Court: Dred Scott v. Sanford). Reading Vattel makes it clear that he is not stating what the law is, but what he believes it should be (and so the reason he is not cited on citizenship matters by the courts). Read your own quote from Vatel: “I say”, not “the law is”. This is the kind of mistakes one is led to when they get all their information from an advocacy source. every case from SCOTUS that I have read says PARENTS. I do not think the founders were unclear. Obama was a dual national, which he freely admits. I do not think this is a hard thing to understand. Personally i have nothing against Obama being president even though I voted third party. My issue is that it appears that no one is responsible to affirm that people on the ballot for president are actually eligible to BE president. This issue is not a new issue, it just has not to date been challenged in the courts. According to the US state departments own website, McCain wasnt eligible either, as there is a clause that states something to the effect of “contrary to belief, US bases are not US territory and children born on them are not US citizens.” ( do a google search and you can find the clause) I present this just to show I am not personally against Obama, BUT if there is a guestion about whether or not he is eligible, I think it should concern everyone..whether they voted for him or not as it sets a precedent to ignore what the constitution says, and there is too much of that going on already from both sides of the aisle. I just think it would be beneficial for Obama to lay to rest all these issues that challenge the constitution by presenting a long form birth certificate. Believe what you want, but no where are you going to find a clear and consise law pertaining to “natural born” as it concerns the presidency, as it has never to date been challenged in front of the SCOTUS, we can go back and forth all day, read thousands of blogs in regard to citizen ship and birth certificates and who is eligible and why and who isnt, to me its all ridiculous, just show the damn long form certificate to put the whole thing to rest. I can give him the 12 bucks it would cost to get a long form if he doesnt have it. Anne, you still have not offered one case that makes citizen parents a requirement for one to be a natural born citizen. The reason you see parentage mentioned in citizenship cases, is that it has always been assumed that citizenship at birth and natural born citizenship was understood by everyone for those born in the United States. Nowhere in the Constitution does it say anything about the children of citizens even being citizens; only people born in the United States are guaranteed citizenship by the Constitution (14th Amendment). 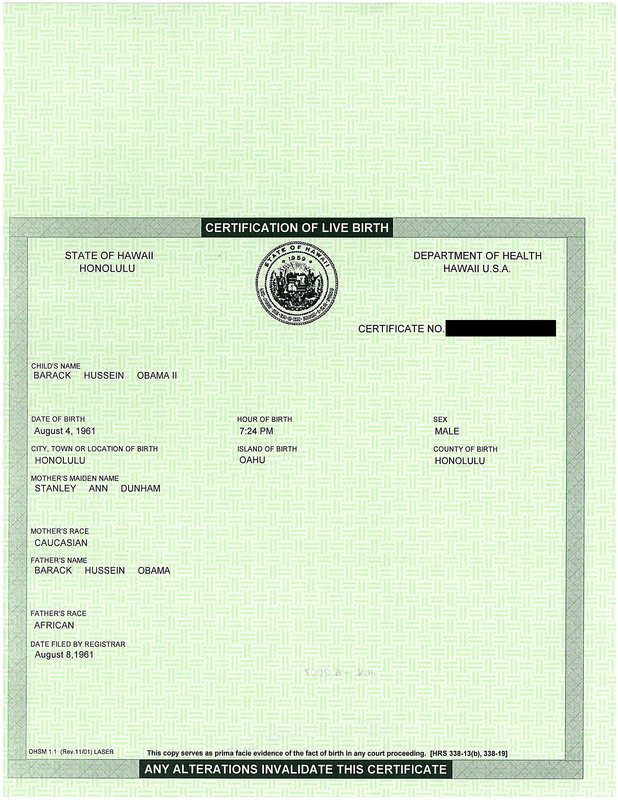 I further do not understand your comment that ” just think it would be beneficial for Obama to lay to rest all these issues that challenge the constitution by presenting a long form birth certificate.” I do not see how any document would change your contention that natural born citizens need two citizen parents. 2. U.S. Supreme Court Ruling. in the first naturalization act, enacted in 1790, which provided “the children of citizens of the United States, that may be born beyond sea, or out of the limits of the United States, shall be considered as natural born citizens.” Arguably, this enactment by the First Congress reflected the original understanding of “natural born citizen” as encompassing those born of the citizen-sovereigns on foreign soil. On this interpretation, John McCain would be a “natural born citizen” of the United States (at least for the purposes of eligibility for the presidency) because the original meaning of that phrase includes all persons born to American citizens. Now, point of clarification, you will notice it says CITIZENS(plural to mean TWO parents) The above was what the non binding resolution co sponsored by Obama used to define whether McCain was a natural born citizen…so if that is what applies to McCain according to the non binding resolution, it also applies to Obama in regards to two US citizen parents. Thats my contention. On another note, the cases before SCOTUS to date have had no standing. None of the plaintiffs could prove they have standing…..however that will change after today when congress counts the votes. The Donofrio case is scheduled for tomorrow (again) for conference. Does this mean he will have standing?? as to the birth certificate, I do not think it would truly matter where he was born. Some of the cases though claim he wasnt born here. Those can be easily disproven by just presenting a long form b.c. the ones making claim that he is not natural born in my view have more merit. read more here, another blog, but with a different interpertation of what the founders meant in regards to “natural born”. Anne, you make two fundamental errors. Any amount of case law and constitutional commentary which you should have read by now make it abundantly clear that common law which was in effect at the time of the enactment of the Constitution made those born in a country citizens (this is why it is not further defined in the Constitution). Read United States v. Wong for the Supreme Court’s summary of common law and previous court decisions. What you see in the Naturalization Act of 1790 is an addition to the common law definition of citizenship, extending natural born citizenship to those children born outside the United States to US citizens. Because the Naturalization Act of 1790 is no longer in force, the Senate repeated its language as a justification for their resolution (and rightly so). But all that notwithstanding, nothing has overruled the common law definition of citizenship which was the only definition of citizenship that existed at the time of the ratification of the Constitution. It could be argued that the Naturalization Act of 1790 is unconstitutional because Congress is not granted the power under the constitution to define natural born citizenship (only naturalized citizens), and hence the 14th Amendment was required for this purpose to make the freed slaves “citizens at birth”. Berg’s case is not being heard tomorrow. Berg’s application for emergency relief is being heard tomorrow. Given that this application has already been denied by individual justices, I would expect no different results tomorrow than in the past. I would not expect his case to ever be heard (the Supreme Court only hears a fraction of the cases it receives, and Berg’s case is a poorly-prepared crank lawsuit — see my article Snowball’s Chance in Hell). 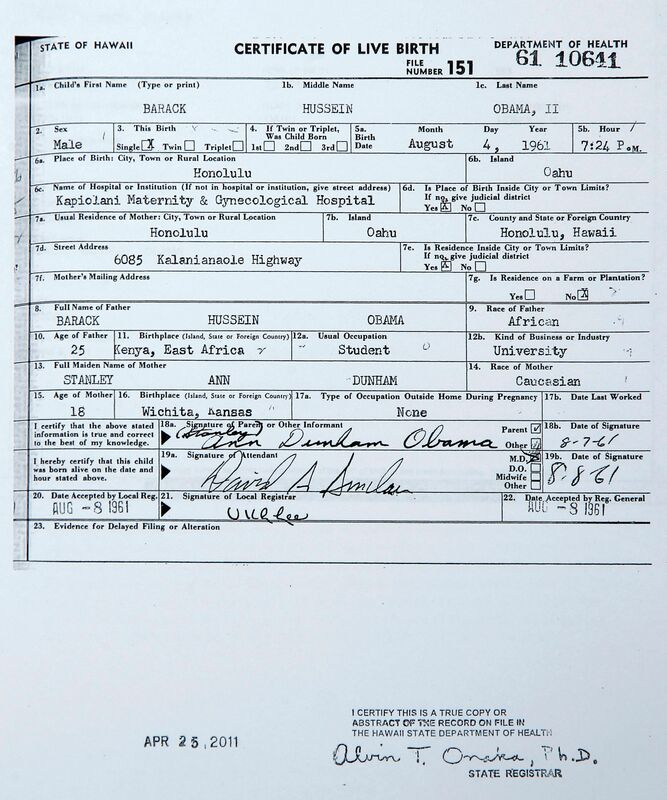 I believe Obama’s citizenship (and his natural born citizenship) hinges on where he was born, although presenting a birth certificate to anyone questioning the location of his birth, as you say, would settle that question. The legal challenge to the definition of natural born citizen has no chance of prevailing, but at least it is a legitimate attempt. The Donofrio case has been denied. You mean the Berg case, first time, petition for cert, 2nd time will be Jan. 16, application for stay. I suspect both will be denied. You left out some things like the 14th Amendment, Naturalization Act of 1940, Immigration and Naturalization Act of 1952, U.S. Supreme Court Decisions,Title 8 of the U.S. Code, Section 1401. “Anyone born inside the United States, subject to the jurisdiction.” (excludes child of diplomat as example). Now, do you see anywhere in that sentence that both parents have to be citizens? Then go look at Wong Kim Arc 1898.
Who is a natural-born citizen? Who, in other words, is a citizen at birth, such that that person can be a President someday? The 14th Amendment defines citizenship this way: “All persons born or naturalized in the United States, and subject to the jurisdiction thereof, are citizens of the United States and of the State wherein they reside.” But even this does not get specific enough. As usual, the Constitution provides the framework for the law, but it is the law that fills in the gaps. * There is an exception in the law – the person must be “subject to the jurisdiction” of the United States. This would exempt the child of a diplomat, for example, from this provision. There are two schools of thought on this subject but most American’s believe that if you are born in America, then you are a “natural born citizen”. It all depends on how you interpret the laws, precedents, etc. However, as I stated before, there are only two entities that can establish/define once and for all who would be a “natural born citizen”. 2. U.S. Supreme Court decision. Why do you think Wrotnowinski included the “historical new evidence” regarding President Chester Arthur 1829 (1821-1885) and his appointment of Justice Gray (Wong Kim Arc 1898) in his pleadings? Duh! The article you cite says that the framer’s intent is defined by the works of an influential Swiss philosopher, not British common law which was in effect when the Constitution was ratified. The Supreme Court in the case of United States v. Wong Kim Ark stated that citizenship at the time of the ratification of the Constitution was defined by British common law. So the issue of whether to rely on Vattel or British Common Law has been decided. And even Vattel writes of what he believes (“I say”) should be, not what the law was. The Wong case is cited over and over again by subsequent cases and is definitive on the subject of citizenship. And Chester A. Arthur can rest in peace! That is what you are not getting. Doesn’t matter what you or I “think the founders meant”. (Vattel vs Common Law) The only thing that matters is the amendments, laws, acts, precedents etc. that have been enacted since. You gravely misunderstand why these Plaintiff’s do not have standing. It is because their grievances are generalized, meaning, Berg/Donofrio/Wrotnowski’s “injury” or “harm” is no greater or less than any other citizen. For purposes of standing, such harm is too remote, too vague. Berg’s harm becomes no more or less generalized after the votes are read today. He still has the same standing problem. Please google “Lance v. Coffman” (2007)if you’d like a quick overview on SCOTUS’s view of generalized greivances in relation to standing. It is a 2007 SCOTUS decision. It may enlighten you! 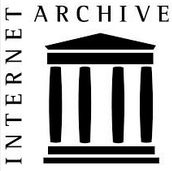 We have consistently held that a plaintiff raising only a generally available grievance about government—claiming only harm to his and every citizen’s interest inproper application of the Constitution and laws, and seek-ing relief that no more directly and tangibly benefits him than it does the public at large—does not state an Article III case or controversy.” Id., at 573–574. See also Daim-lerChrysler Corp. v. Cuno, 547 U. S. ___, ___ (2006) (slip op., at 8) (refusing to create an exception to the general prohibition on taxpayer standing for challenges to state tax or spending decisions, and observing that taxpayerstanding has been rejected “because the alleged injury is not concrete and particularized,’ but instead a grievancethe taxpayer suffers in some indefinite way in common with people generally’” (citation omitted)). U. S. 126 (1922), for example, a citizen sued the Secretary of State and the Attorney General to challenge the proce-dures by which the Nineteenth Amendment was ratified. We dismissed the suit because it was “not a case within the meaning of . . . Article III.” Id., at 129. The plaintiff sought to assert “only the right, possessed by every citizen, to require that the Government be administered according to law and that the public moneys be not wasted.” Ibid. “Obviously,” we held, “this general right does not entitle a private citizen to institute [a suit] in the federal courts.” Id., at 129–130. v. Mellon, 262 U. S. 447, 488 (1923) (taxpayer standingcannot be predicated upon an injury the plaintiff “suffersin some indefinite way in common with people generally”).Cf. Tyler v. Judges of Court of Registration, 179 U. S. 405, 406 (1900) (“[E]ven in a proceeding which he prosecutesfor the benefit of the public . . . [the plaintiff] must gener-ally aver an injury peculiar to himself, as distinguished from the great body of his fellow citizens”). Doc Orly thinks her case has standing. One must make the distinction between “no standing” and “no leg to stand on”. She probably does have standing, just no case. While Berg filed initially in federal court where federal rules of standing apply, Donofrio and Wrotnowski filed in state courts where rules of standing are generally more lenient. But keep in mind, the Supreme Court is a appellate court. If they granted writ to Berg or Lightfoot, all that could happen is that the case would be sent back to the lower court for trial. The Supreme Court doesn’t try cases and hear evidence (except for suits between the states). Dr Orly apparently also thinks Fitzgerald is going to arrest Obama, so, she clearly lives in a complete world of delusion. Oh no, Doc Orly says hers has standing and is better than Berg/Donofrio’s, etc. The Judges scheduled her case behind Berg’s on purpose in case Berg’s does not go well. Here is a exerpt from her post. Gives you an idea of how this woman thinks. Yikes! Agreed. Standing issue more easily overcome in state court, prob with that is, they waited too long at the state level. The cases in state court are moot given where the political process is at present (votes counted today). Not to mention political question doctrine, and the fact that the majority of these cases actually fail to state a claim. The fact that Taitz has swept the shop floor and scooped up everything into this complaint suggests to me that this case is intended for public consumption and not court consumption. It is a publicity stunt. I think the California Supreme Court’s one-word opinion, says volumes about the quality of her suit. I fully expect the Supreme Court to concur with the lower court, and use identical language in its decision. 3. This will not impress the Supreme Court. 4. Cleaver was clearly ineligible (35 years old). Obama is clearly eligible. 6. Resuscitation has about as much chance of success as a favorable ruling from the Supreme Court. You can’t sue over how the dead elector is handled, until the dead elector question is handled. Regarding the reporting on any comments made by members of Barack Obama’s extended family, what are the chances the crack reporter corps of such outfits as Wing Net Duly and Ownin’ my Crimes actually getting out from behind their Cheetos encrusted desktops, going to Washington D.C., and getting some of the answers to the myriad of theories they’ve helped put forward for countless months now when Sarah Obama visits the U.S. for her step-grandson’s historic swearing in next week? They have been commenting about this on all the “patriot” websites about how Obama will have her “under wraps” and a reporter will not be able to get to her. Making a big deal about Obama’s mother-in-law living in the White House. That’s wonderful. I’ve watched several videos of Sarah Obama and she’s a delightful lady.